Sykora, a Somers Point businessman and member of the Planning Board, did a WIBG Radio interview in which he told the story of Richard Somers and the Somers rings and describes the most recent legislative efforts to repatriate the remains of the men of the Intrepid from Libya. Greg Sykora – Radio Interview with Dan Kline – WIBG January 2012 The basic components of the story of the Intrepid and what happened in Tripoli and the most recent efforts to repatriate the remains of Richard Somers and the men of the Intrepid. Richard Somers is a true American hero, was born during the revolution, was one of the first midshipmen to enlist in the U.S. Navy and he died fighting pirates in Tripoli where he remains buried today. I like to tell the story in the framework of the rings, which symbolize who Richard Somers was and the friends ship and “band of brothers” bond he developed with the other officers he served with. Actually there’re two ring stories- one at the beginning and one at the end. The first one is the George Washington Ring. George Washington, the commander of the Revolutionary Army and first president, gave out four rings, and one of these rings was given to Richard Somers when he enlisted in the Navy. It’s now at the Attwater-Kent Museum in Philadelphia, and it has a lock of George Washington’s hair within the ring. It’s one of the famous George Washington rings, one of which was given to Richard Somers. The second ring story goes back to the night they sailed the Intrepid into Tripoli Harbor. You have to understand that they just didn’t go over there and go right into Tripoli Harbor. Now these guys were great sailors, they sailed their whole lives, that’s what they did. They set up a blockade and were taking these pirate ships out as they came out of Tripoli Harbor. What they wanted to do was take the armaments off the captured ships and place them on a captured ship they re-commissioned the Intrepid. The ship we see in the pictures, the ketch Intrepid, was actually a captured pirate ship. It became a fireship. One of these ships that blockaded Tripoli harbor and chased the pirates was the frigate, Philadelphia, the largest ship we had, which had run aground while chasing some pirates into Tripoli Harbor. It started out as a major catastrophe with the 300 officers and men along with 40 cannon captured by the enemy. Some of the story of Richard Somers comes from the captured sailors from the Philadelphia. They were watching all of this happen from the old castle fort that’s still there, where these POWs from the Philadelphia were being held captive,. The Philadelphia, the ship that ran aground and was captured by the pirates was recaptured and sunk by Stephen Decatur while it was in Tripoli Harbor. One of their missions was to destroy the Philadelphia and they were able to do that, using the Intrepid disguised as a pirate ship to sneak into the harbor at night. It was a covert operation, a precursor to the Navy SEALS kind of thing. They could make a movie about this. Then they refitted the ship, the 64 foot ketch Intrepid, loaded with armaments that had been captured and essentially they made it into a fire-ship – a floating bomb. It could do nothing but sail and explode, that’s all it could do. The idea was to take this floating bomb, sail it into the harbor, light a fuse on fire, escape in row boats, blow up the whole thing, and take out all the ships in the harbor. It was a good idea and it could have worked. Before they left there was a meeting on Stephen Decatur’s ship. Decatur was to wait for them, grab them escaping in the row boats, and get away in Decatur’s ship. The night before they were ready to go, there was a meeting in Stephen Decatur’s quarters with Richard Somers and Charles Stewart, another officer who attended school in Philadelphia with Decatur and Richard Somers, and all three had enlisted in the Navy together on the first day the Navy was commissioned. They took a ring and cut the ring into three pieces, and said that this was our bond, our friendship. This is the famous three pieces of the ring. Then Richard Somers told the crew that this was probably going to be a suicide mission, and anybody who didn’t want to go, he will completely understand. The twelve guys said we’re doing this. This is our country and we’re doing it. They tried to do this on Sept. 1st, 1804, but it was cloudy and there was no wind. So they go in a second time and get a little further, and realize they can’t do it again, and come back out. The third time they made the dash to go in, but it was believed that because they had tried twice before, the Libyans were ready for them. That was one of the problems. They sailed the Intrepid in and as the story goes, the ship was boarded, and instead of letting them have all the armaments, it would have really turned the tide on everything that was going on, Richard Somers lit the thing on fire and blew up him and everybody else. From that point the bodies washed ashore, and as told by the POWs from the Philadelphia and the Muslims at the time, since these were infidels, they threw them in the street and dogs were mauling them. Some were in pieces .Some were in full bodies, and then the POWs from the Philadelphia dug the graves and put them in the graves. Actually, there were really four graves, three graves for the three officers, and then the other mass grave was for the other men. That’s a brief history. It’s a little disheartening that the local school system doesn’t teach this. How can they not teach such a tremendous American historical story? This should be part of the curriculum of every history class in the nation, but let’s just limit it to South Jersey and Somers Point – it all started here in our little neck of the woods. But the story doesn’t end there. In fact in many ways, what we are talking about, it may be just beginning. Now there’s the repatriation effort with the families trying to get those bodies back. You have to go into hostile territory to do that, and there’s a million different reasons why it didn’t happen, there were many different efforts along the way, and I’d like to think that we’ve taken it further than any other effort. And it seems like we almost got them home except for John McCain. I got involved in this effort to get these men home some 20 years ago. Actually it had a lot to do with the Route 52 bridge project between Somers Point and Ocean City, NJ. Twenty years ago they started coming around and talking about it, you know the DOT doesn’t move quickly, it takes them 20 years to plan for a ten year project. And one of the discussions was what we were going to do with this Somers Mansion, which is the home of Richard Somers’ grandfather. I was on the planning board, and the Historical Society got involved. That’s when I met Sally Hastings, now the President of the Historical Society. And it was intriguing to me that we have all this stories, this rich history right here under our nose, a hidden nugget that nobody realizes is even right here. As time went on I got more and more involved in the effort. There was another guy Seth Grossman, one of the original guys who got involved in creating Richard Somers Day, which is kind of a new thing, going on for about ten years now. But rather than just Richard Somers, the repatriation effort is for the entire crew of the Intrepid. At one time it was all about Richard Somers, but then we took a different tactic. There is a gentleman named Chipp Reid who has written a book called The Intrepid 13, and as he was getting into the story and writing this factual and historical book, he recognized the fact that it wasn’t really as much about Richard Somers as it was about the Intrepid and these men. They came from Maine, Massachusetts, Annapolis, Maryland, Philadelphia, the thirteen colonies. They were a smattering of men from all over that were on that boat. And as a strategic measure to bring them back, we decided to involve these other men, their families and these other states. And I will give a lot of credit to our mayor, Jack Glasser of Somers Point, who wrote many, many letters to the mayors and council people in other towns and got them involved. Some got involved and some didn’t. But it made our hand stronger when we went down to Washington to lobby for these things that it wasn’t just about this little four square mile town in Atlantic County, New Jersey. It was about the 13 men of the Intrepid and their participation in this historical event. What will happen? We got prices on this. It will cost about $85,000 – and as far as the Navy goes, it is not a big appropriation for them. That would pay for them to go get the bodies, bring them back and rebury them. They would take all the buttons and bones and whatever is left and separate them, put them into containers and they would be sent to Hawaii where the Navy has a forensic laboratory, and after an autopsy and DNA testing, they will be placed into 13 graves. It will take about 18 months for everything, from the time they go over there, to the time they are put into the ground and given a patriotic burial with full military honors. We have our American heroes, the fore-runners to the modern navy, the first American Marines and SEALS and the genesis of it all right here. But it’s a national story, and one that anybody from coast to coast can be completely proud of. The kind of story this nation was built on. Rep. Frank LoBiondo had picked up on this as well. He was involved from the very beginning and as our Congressman, he ran with the ball. He tried to do many things in a short amount of time He dug his feet in, but was blocked at every angle, and personally I want to thank Frank for all his efforts. It was about two years ago when Frank got another Congressman involved, Mike Rogers from Michigan, a veteran and the powerful head of the House Intelligence Committee. Rogers actually went over to Libya and visited these graves while he was there. So what they did was they put together a bill, the repatriation bill, which had to get the support of a majority of the 400 plus members of the House of Representatives. They recognized that the bill standing alone would not go anywhere, so it was the genius of Mike Rogers to make it an amendment to the budget of the DOD – the 2012 National Defense Authorization Act. And this past year, in 201,1 we went down there and lobbied, and the amendment, sponsored by Rogers and LoBiondo, passed the House of Representatives. And here we are, got it through the House. This was great. We finally did it, and now all we had to do was get it past the 100 guys in the Senate. I’ve been down to Washington before on other issues, but this was different. We had meetings with a number of Senators, mostly with their staff, who really do all of the work. Most of the Congressional staff are in their twenties and thirties, except for McCain’s staff, who are in their fifties and sixties. Imagine that. Everyone was endearing, glad to see that we took our time to come out, that the families were there, and we had our facts and showed them what we had, and they were all glad to help push this thing along, except McCain’s office. We go to McCain’s office and they had a staffer there by the name of Walsh, and he wouldn’t let any of us into the room except for the families – the two families, Somers and Wadsworth, four people, and he basically accosted them. He said, “What are you really here for? You want money for a monument? What is this really about? You can’t be serious about bringing these family members home – you didn’t even know them.” It was really ignorant, a bad situation. This is a staff member in McCain’s office. So at the very end, we don’t have any sponsors on the Democratic side, but had a lot of positive response except for McCain’s office. The next day, we had about twenty people, got a lot of attention at a staff meeting, and there was this guy raising his hand and asking these questions about McCain, why isn’t he for it? We said we didn’t know, and he got up and left the room. We finished the meeting but we didn’t know who he was. When somebody is sponsoring something in the Capitol, everybody gets on their Blackberries immediately, and it kind of goes through organic communication. It turns out that guy was a John Kerry staffer, and he went back to Kerry and when Kerry found out that McCain was against it, Kerry wanted to be for it. So Kerry was the first Democrat to sponsor the bill in the Senate. And he’s a big guy, and before long these others – Lautenberg, Menendez jumped on board and we have green lights all over. We thought all we had to do was go home and watch it happen on C-SPAN, but what we watched was John McCain being the ranking officer of the Dept. of Defense bill that was going through with our amendment attached to it. People think it is the Libyans who was stopping this from happing, but it wasn’t the Libyans, it was John McCain. The Libyans were always cooperative. We had an international lobbyist who had a relationship with Gadhafi and they loved the idea. You have to understand that there’s only 13 Americans in this cemetery in Tripoli. It’s an international cemetery, not an American cemetery, and its not American ground. It’s on hostile ground. It’s off the beaten path. It’s near the water’s edge and its falling down. It looks like it might wash away someday. 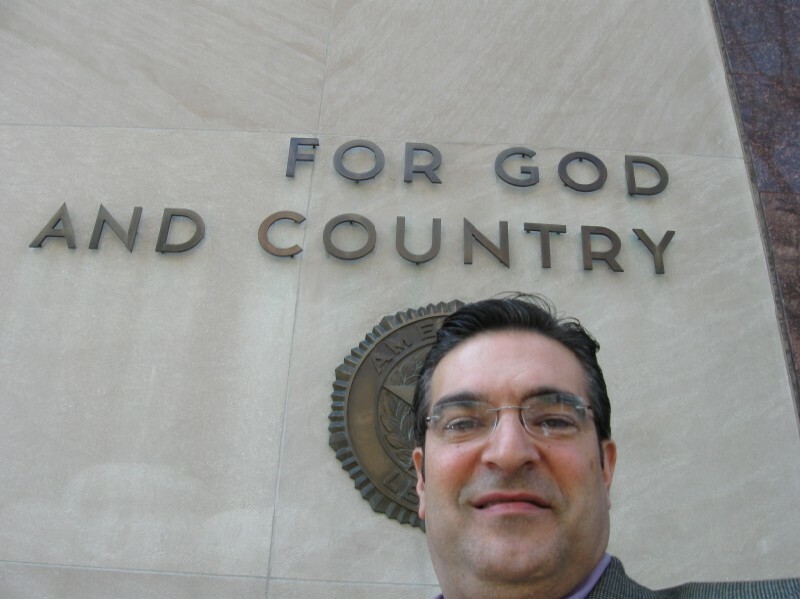 Mike Caputo our lobbyist made the relationship with the Libyans and they were so excited about it they commissioned a book to be written about every single one of the people buried there in that cemetery. The book is two and half inches thick. It’s huge, and of course it is written in Arabic, and the author historian Chipp Reid who wrote the Intrepid book, he had the sections devoted to Richard Somers and the crew of the Intrepid translated. They clearly identify that the bodies are there and our history is in their books. They figured that this would be a way to make a good relationship with us, but then the international situation deteroiated, and all of a sudden things were cut off and that stopped that effort completely. But it didn’t stop the fact that the book was written or some of the other things that had gotten started. The excuse we got at that time actually came from the State Department that we need to have a relationship with Libya and that cemetery would be a perfect shrine. Our position was – keep the shrine, that’s great, who knows what’s under there, we just want the bodies. It doesn’t matter, we just want the bodies. So the Libyans, for whatever reasons, have always wanted to work with us. People think it was them – the Libyans, who were preventing this from happening, and McCain and the Navy would probably like people to think that. McCain happens to be a ranking official on the Senate Armed Services Committee and that ranking official gets to set the agenda for the bills. So the bill is coming forth and there are all these amendments on it, including the repatriation amendment. And as you read the amendments on the Dept. of Defense Appropriations bill, which is where the Navy gets its money, McCain is going through them one by one and they put all these amendments on there, and when they get to the Richard Somers Repatriation amendment, and they skip over it, they pull it, and it doesn’t make it as an attachment to the bill. So now that amendment isn’t an amendment any more, it is Section 598, is the number of what this piece of legislation that was peeled off, but it can’t just go away, it goes into what they call a conference committee, and they talk about it and they discuss about what it is and why and how they can deal with it. Now keep in mind there are a couple of hundred amendments that are associated in a bill of that magnitude and it is set aside and it becomes a section – Section 598 of that bill. Basically what happens now is that it is in this conference meeting, which I have to say was their way of trying to squash this thing. Well, our Congressman Frank LoBiondo muscled his way in on that conference and he led the charge to get them to look into it a lot deeper than what they wanted to. Now interestingly enough, the money they are spending to look into it is greater than the complete repatriation effort, but that’s beside the point. In the end of the day, the win for us was that Section 598 gives the Navy 279 days, which puts us at October 1st, 2012, to give a complete report on what their position is on this effort. Interestingly enough, it’s kind of confusing, but at the same time this was going on, the Secretary of Defense, Leon Panetta, you may have seen the article about it in the Press of Atlantic City, he went over there to inspect the graves himself. Now the interesting part of it is, before he went over there, on the way over there, American soldiers went in and renovated the Protestant Cemetery, the cemetery that was falling down. It was no place for anyone to live or for our heroes to be buried, and they went in and renovated it, patched all the walls and cleaned it up. We were wondering who it was. We found out through the Veterans for Freedom that it was the American soldiers who were told to go in and clean the place up. We don’t know who told them, but when Panetta was walking through the supposedly decrepit cemetery, the walls weren’t even dry from being patched. So that was pretty disheartening for us who are trying to paint a picture of the cemetery as it really was. So now they are saying we don’t have to go over there and get these men because the cemetery is fixed up. But it’s more about the fact that it is not United States ground, not a place for any American, let alone a sailor who has dedicated their life to our country, heroes from the genesis of our Navy. 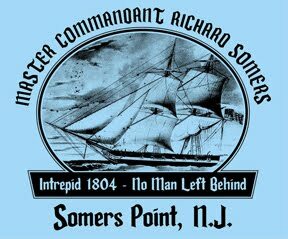 We are also trying to raise money for a monument for Richard Somers in Somers Point, and we have a completely volunteer Monument Committee that’s designing a monument and raising the funds for it. So we’re working on that angle. The next thing is to contact McCain, find out what’s inside his head. He’s not taking our calls in DC. I don’t want to say cover-up. I won’t say those things. I just want to say, answer the question. Why don’t you want to do what needs to be done? We are also trying to do our own study on it and that might happen. But that’s where we stand right now. When we are finally successful, and we eventually will be, when the remains of Somers and his men are finally brought home, it will be a great day for Somers Point, for Atlantic County, for the State of New Jersey, for American Veterans, even for the United States Navy and the entire nation. The Somers Washington ring is one of the most legendary relics of the nation’s family jewels. It contains a lock of George Washington’s hair and was given to Richard Somers, one of the first young officers of the United States Navy. 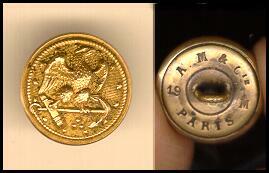 While Somers was killed in the September 4, 1804 explosion of the USS Intrepid in Tripoli Harbor, and his remains are still buried there today, his ring never made it to its proper heirs, was donated to the Pennsylvania Historical Society, discarded to near obscurity, stolen by a janitor, sold to a private collector and eventually recovered by the FBI. Featured in a History Channel TV show about the special FBI art theft unit that recovered it, the Somers ring, is currently stored in a secure vault alongside other rare artifacts at the museum near Independence Hall in Philadelphia. It was last put on display among other Washington affiliated items and may be put on public display once again with the anticipated repatriation of the remains of its original owner, Master Commandant Richard Somers, USN. Born during the American Revolution in Somers Point, New Jersey, Richard was the son of a privateer who the British branded a "pirate" for capturing their merchant ships and advertising the sale of their contents. As the son of a Quaker plantation owner from Somers Point, NJ, Richard was trained and educated to be a gentleman at the Philadelphia Free Academy. This school could be considered the naval academy of its day, as its principal instructor was John Barry, a schoolmaster who had the first book copyrighted in the United States and associated with his namesake, Captain John Barry, the first commissioned Captain in the U.S. Navy. Three of Barry’s Philadelphia Free Academy students - Richard Somers, Stephen Decatur and Charles Stewart became the first Midshipman in the new Navy and assigned to Captain John Barry aboard the U.S.S. United States, built at the South Philadelphia Navy Yard. It was in 1798, when the paths of George Washington and Richard Somers crossed and Washington had the opportunity to give Somers the ring. Washington, who had served as the first President until a year before, visited the recently launched frigate United States, and reportedly had dinner aboard the ship with Captain Barry. At 7 P.M. on evening November 9, 1798, when the United States was anchored at Chester, Pennsylvania, Captain John Barry and the ship’s designer and builder Joshua Humphries came aboard. Shortly thereafter, General George Washington arrived at Chester, where the horse troops of the Philadelphia cavalry received him. Washington stayed in Chester overnight, possibly aboard the United States, which gave him a 15-gun salute upon his departure the next morning. It was customary for the Captain to entertain guests in his cabin for dinner, and include his top officers and Midshipmen, which would have included Somers, Decatur and Stewart, and a unique occasion for Somers to have obtained the ring from Washington. After tours in the West Indies and Mediterranean, primarily chasing pirates, Midshipmen Somers and Decatur were promoted to Lieutenants and given command of their own ships. Congress approved the construction of a number of frigates and four schooners, but the young officers couldn’t wait to build new boats and Somers oversaw the refurbishing of an old, discarded Delaware river fishing schooner rechristened the USS Nautilus. Decatur got the USS Enterprise, while Stewart was in command of the Syren and they set off across the North Atlantic to fight the Barbary Pirates. Enroute Decatur encountered and boarded a suspicious merchant vessel, and discovered the sword of an officer from the USS Philadelphia, a frigate sent to blockade Tripoli harbor that ran aground and was captured. Decatur took the ship as a prize, made the pirates prisoners and rechristened the captured ship the USS Intrepid, putting it in good service fighting the pirates. Just before emarking on his last mission aboard the Intrepid, Somers huddled with his Philadelphia school mates Stewart and Decatur, took a ring off his finger, cut it into three parts and gave the others each a piece. This was not the ring Washington had given him. The ring with Washington’s hair was left back in Philadelphia with his sister Sarah. The dark blue and white enamel ring contains thirteen pearls surround a glass locket, and is said to contain a genuine relic - a piece of George Washington’s hair. Washington reportedly gave the ring to Somers around the time he was granted a warrant as a midshipman, in April 1798. Before he left to fight the Barbary pirates, Somers had the ring and gave the ring to his sister Sarah Keen for safe keeping. Sarah’s husband William Kean was an attorney who became the executor of Somers’ estate, which included most of Somers Point, New Jersey at the time, also included the ring. William Keen had also handled the distribution of prize money from a pirate ship Somers had captured. When Somers never returned from Tripoli, his sister Sarah inherited the ring, and when she died, the ring was passed on to her niece, Sarah Sophia Leaming, of Upper Township, New Jersey. Somers’ sister Sarah was buried in a grave next to the old New York Avenue schoolhouse, and left money for a monument to be built to ensure the community didn’t forget her brother, whose remains are still buried on the Tripoli harbor beach. Sarah Sophia Leaming, the daughter of Richard’s nephew Constant Somers, had married William Leaming, and their son Jonathan Leaming makes mention of the ring. The affidavit of Jonathan Leaming (December 25, 1891), the son of Constant Somers’ daughter Sarah and William Leaming, attested that, "…Among the personal effects of Sarah Keen was a peculiar, antique finger ring, which was always called Washington’s ring. It is a flat, gold ring, with a square setting of dark blue enamel. On the outside edge of this dark blue enamel square is a small stripe of white enamel, and in the center of said square is a round box and glass containing hair surrounded by thirteen pearls. On each side of said square, on the shanks of the ring are alternate gold and light blue enamel stripes, within which field of stripes on each side, is small circle of dark blue enamel. The hair contained in this ring is said to be that of George Washington." "This deponent avers that he has frequently heard to said Sarah Keen declare that this ring was presented to her brother Lieutenant Richard Somers, by George Washington, the first president of the United States, and that the hair within the setting was that of George Washington, and that her brother had left the ring in her care when he embarked for Tripoli…"
In 1926, Edmund Leaming, the grandson of Sarah Sophia Leaming, then Vice Chancellor of New Jersey, loaned the ring to the Museum at the State House at Independence Hall in Philadelphia. A Philadelphia Inquirer newspaper report in January 1932 notes that the Somers ring was only one of four known rings with locks of Washington’s hair, and that Leaming intended to donate the ring to the Cape May County Historical Society, but he died before he could arrange for that to happen. The ring was put on display in Philadelphia until the National Park Service took over operations of the museum in the 1950’s. The ring was then said to have been bequeathed to the Pennsylvania Historical Society in 1958 by the remaining Leaming family of Morrestown, and was put into storage. While there are no listings for anyone named Leaming in the Morrestown phone directory today, there are plenty of Leamings in Cape May County. On Route 9 in Upper Township today there is a large estate called the Leaming Plantation, which dates to the earliest settlers, whaling families from New England. With the large, Quaker Somers family owning most of the land north of the Egg Harbor river, and the Leamings south of it, it was natural for the Somers and Leaming families to have some inter-relationships, and the Somers – Leaming connection goes back to the earliest days people lived there. Susan Leaming today, is a distant but clear relative of the Somers-Leaming family of yester-year, and original owners of the Somers’ Washington Ring. While the ring was kept among the extensive collection of artifacts of the Pennsylvania Historical Society (PHS), a nighttime janitor, Earnest Medford, made some spare money by pilfering some of the closeted items, mainly antique swords and guns, but also other items, including the Somers ring. He sold them for cash to George Csizmazia, an electric company superintendent and local connoisseur of historic weapons. Csizmazia didn’t do collect them for profit, and resell them, but rather kept them for himself. He stocked his suburban apartment with millions of dollars in museum quality artifacts that he got from Medford the janitor for only about $8,000. The Somers ring, a one-of-a-kind item, is priceless, and could not have been sold on the open market without being immediately recognized by collectors. While he didn’t try to sell his stolen collection, he was proud of it, and after Csizmazia showed off some of his prized swords at an antique show, he became a marked man. 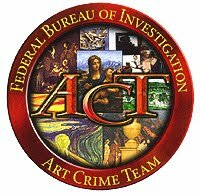 When the museum staff began to itemize their collection and realized some things were missing, they called the FBI Art Theft unit, which is based in Philadelphia, to investigate. Since Csizmazia had showed off some of his prized swords at an antique show, the FBI questioned him and he immediately confessed. He then told the FBI about Medford, the janitor, and both were convicted in court and received four year prison terms. When Csizmazi took the FBI agents back to his apartment, they found a virtual National Treasure of looted antiques and artifacts, including Somers’ Washington Ring. Now as the remains of Somers are being considered for repatriated home, his ring should be returned to the Somers family and put on public display once again. Master Commandant Richard Somers - Commander of the ketch Intrepid on its last mission. 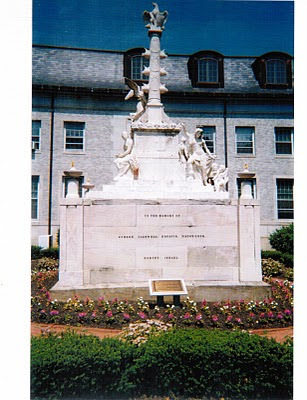 It says, inscribed in Latin on the Tripoli Monument at Annapolis, "Here lies the remains of" before the names of the officers who died in the course of the first war against the Barbary Pirates, including Richard Somers, Henry Wadsworth, Joseph Israel, James Decatur and James Caldwell, among others. This clearly indicates that the officers who had the Tripoli Monument built certainly intended their remains to be retrieved from their Tripoli graves. While Somers, Wadsworth and Israel were killed in the September 4, 1804 explosion of the Intrepid in Tripoli harbor, the others also died in the course of the Battle of Tripoli and are buried somewhere along its shores. One of the goals of the mission of the Intrepid was to free the 300 man crew of the frigate USS Philadelphia, which ran aground while chasing a pirate corsair into Tripoli Harbor. Captain Bainbridge surrendered his ship without a fight, which would later lead to his court marshal and acquittal, while his first officer, Lt. David Porter would, once freed, take up the collection to have the Tripoli Monument constructed. Lt. Stephen Decatur, Richard Somers' childhood schoolmate, took the Intrepid into Tripoli harbor one night disguised as a trader that had run the American blockade, and recaptured and sunk the Philadelphia in Tripoli harbor. Throughout August 1804, Captain Preble, the commander of the American Squadron, supervised a number of attacks against the pirates at Tripoli, engaging the entire American fleet on at least four occasions, having the larger ships fire cannon broadsides against the castle batteries, while the smaller ships escorted gunboats with cannon mounted on their bows into the enemy fleet, at pistol range and often engaged in sword duels and hand to hand fighting. Preble assigned Richard Somers to oversee one flank while Stephen Decatur oversaw another, and both achieved success in the fighting during every attack. Caldwell's Gunboat #9 received a direct hit from a hot cannonball fired from the castle ramparts. The fireball hit the gunboat's gunpowder and ammo cache, which resulted in a tremendous explosion that completely destroyed the boat and killed everyone aboard. The bodies of Lt. Caldwell and Midshipman Dorsey, their officer's uniforms clearly seen by the American prisoners being mauled by wild dogs. In one fight, Stephen Decatur's younger brother, Lt. James Decatur, captured an enemy gunboat, but the pirate captain, after surrendering, killed young Decatur after his guard was down. In the midst of the battle, when Stephen Decatur realized what happened to his brother, disengaged from his own fight, after capturing an enemy boat, cut it lose and went after the pirate captain who had killed his brother. Finding him, while they were engaged in a furious fight, Reuben James took a sword meant for Decatur and saved his life. Decatur killed the enemy captain, but was reprimanded by Preble for losing the pirate ship he had captured. Some say it was the captured Captain Bainbridge who secreted a note to Preble, suggesting that the Intrepid be outfitted as a fireship and sent back into the harbor to sink the anchored pirate fleet. Somers and Wadsworth volunteered for that mission and Lt. Israel, who outfitted the Intrepid with its explosives, insisted on joining the mission, which resulted in them all being killed, along with ten other men. As with Caldwell, Dorsey and the men of Gunboat #9, their bodies washed ashore and were mauled by the wild dogs before they were given over to an American burial party led by the chief surgeon of the Philadelphia Dr. Cowdery, who identified the three officers, primarily by their uniforms. James R. Caldwell was born in Philadelphia, Pennsylvania, on 1 November 1778. He was appointed a Midshipman in the U.S. Navy in May 1798 and promoted to the rank of Lieutenant at the beginning of November 1800. During the undeclared war with France he served in the frigate United States, schooner Experiment and armed ship Ganges. From late 1801 into 1803 Lieutenant Caldwell was an officer of the frigate Constellation during the initial phase of the war with Tripoli. In mid-1803 he returned to the Mediterranean in the brig Siren to participate in further operations against that piratical North African state. 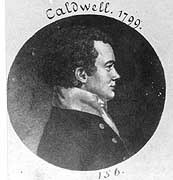 Caldwell distinguished himself in a boat action on 7 July 1804 and also took part in an attack on 3 August that resulted in the capture of three vessels that were taken into the Navy as gunboats. One of these, Gunboat Number 9, was under Caldwell's command when the U.S. squadron again bombarded Tripoli on 7 August 1804. While hotly engaged with an enemy battery, a hot shot penetrated her magazine and Gunboat Number 9 blew up. Lieutenant Caldwell and eleven others were killed or mortally wounded in the explosion. The U.S. Navy has named two ships in honor of James R. Caldwell, including: USS Caldwell (Destroyer # 69, later DD-69) of 1917-1936; and USS Caldwell (DD-605) of 1942-1966. The USS Bainbridge, which is on counter-pirate duty off Africa, is named after the Captain of the Philadelphia. The USS Reuban James was named after the man who saved the life of Lt. Stephen Decatur. There were six US navy ships named after Richard Somers. 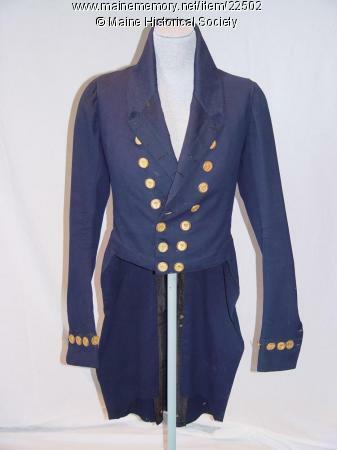 The uniform coat of Lt. Henry Wadsworth, who died in the explosion of the Philadelphia. Lt. James Caldwell and Midshipman Dorsey and the other ten men of Gunboat #9 were possibly buried by locals on the harbor shore or in the slave cemetery. Somers, Wadsworth and Decatur, recognized primarily by their uniforms, were buried by Dr. Cowdery in a mass grave near another mass grave that contained the remains of the ten seamen. When their remains are unearthed, or uncovered in the crypts, it is possible that the three officers can be recognized by their uniforms. If the cloth no longer exists, it is possible that their buttons will be found and provide the clue that will help identify the remains of the officers apart from the others. So besides the three officers and ten men of the Intrepid, the remains of Lt. Caldwell and Midshipmen Dorsey and the other nine men of Gunboat #9 also remain Missing In Action in Tripoli. In addition, five men from the Philadelphia decided to defect and convert to the Muslim faith, but when a treaty was established, and Bainbridge and the men of the Philadelphia freed, they were asked if they wanted to go home and all but one of them did. Instead they were either enslaved or executed, and probably buried in the Slave cemetery. Once freed, Lt. David Porter took up a collection from other officers in Preble's Squadron and commissioned the construction of the Tripoli Monument in the name of the officers who died. Nearly two hundred years later, in 1988, a Navy plane was shot down after bombing Tripoli during Operation El Dorado Canyon, but the body of only one of the two pilots was discovered, and over the following Christmas, repatriated via the Vatican. The other officer remains MIA, and is believed to have been found by locals and buried somewhere near Tripoli. So in total, there are three officers and ten men of the Intrepid, whose remains were recovered and buried, and there was Lt. James Caldwell, Midshipman Dorsey and the other ten men of Gunboat #9. Then there were the five men of the Philadelphia who deserted and were probably executed. That's thirteen, twelve and five, who along with the pilot from El Dorado Canyon makes it 31 US Navy men who are Missing In Action in Tripoli.